Alfred J. Barker, born in 1812 was the son of Robert Barker of Chichester. During his life he had been a runaway at fifteen, officer, whaler, overlander, hotelier and pastoralist. He arrived in South Australia on the Rapid with Colonel William Light on 18 August 1836. Alfred was to have finished his education in France but instead ran away to sea and signed on for a whaling trip lasting three years. Having completed his contract he joined the Rapid with Colonel Light for South Australia. At the end of the trip he was promoted to first mate, did a return trip to Sydney for desperately needed supplies, bought a block of land in Adelaide (lot 147, section 449) on 27 March 1837 and left again for England with South Australia's first export, 150 barrels of whale oil. After her return on 10 June 1838 Barker resigned to try his luck on land in South Australia. He soon realised where some good money could be made and started overlanding cattle and sheep from New South Wales to South Australia. Barker used the money made from overlanding to buy land at Finniss Flat near Yankalilla. Later he was involved with the pioneering of cattle and sheep runs with John McDouall Stuart, William Finke and the Chambers brothers. In June 1842 Alfred Barker married John Chambers' sister Priscilla and took her first to the Crafers Hotel for their honeymoon and from there to his farm at Finniss Flat. After some years of farming, the Barker family, which now included three children, Mary, William Pitt and John, moved to Burra where he held the licence of the Smelters Home Hotel in 1850 and of the Burra Hotel from 1852-1857. Both Alfred and Priscilla Barker were popular hosts at their Burra Hotel where they often provided special dinners for the mine directors and other well moneyed people. As a sign of appreciation Mary Barker was invited in 1861 to christen the new bridge over the Burra Creek at Redruth. In 1862 Alfred bought the Baldina Run, which he had previously managed in partnership with James Humphrey, and the family moved once again. By 1864 it was officially known as Barker's Run. The Barkers did well enough to be able to build a town house at Prospect, which they named Baldina House and retired to in 1873. Alfred's son John later married his cousin Catherine Chambers and together with her brother, John Chambers, formed the partnership of Barker & Chambers. 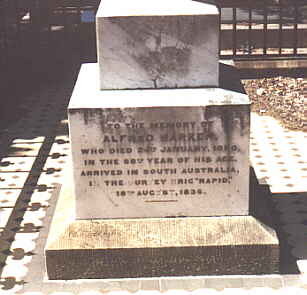 Alfred Barker died at Baldina House on 24 January 1880, aged 68 and was buried at North Road Cemetery. Priscilla died in 1900, aged 84 and was buried at the same Cemetery close to many of her other family members.